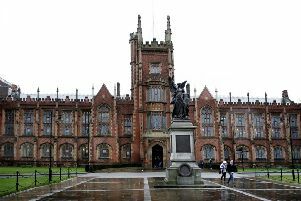 An invitation for the Israeli ambassador to address students at Queen’s University (QUB) on Tuesday has angered pro-Palestine groups and led to a call for the speech to be cancelled. Mark Regev, the country’s chief diplomat in the UK, is due to address students on the subject of ‘conflict transformation and social justice’. On Monday, QUB Students’ Union issued an eleventh hour plea for the university to withdraw Mr Regev’s invitation, saying it serves to “normalise the actions of the Israeli government” against the Palestinian people. Robert Murtagh, the SU vice-president said: “Mark Regev’s political presence contributes nothing to academic understanding of Israeli government actions. A protest against the visit has been organised by the Belfast Palestine Solidarity Campaign. In a Facebook post, the organiser said: “This is a terrible breach of the academic boycott called for by Palestinian civil society. A QUB spokeswoman said an invitation had also been sent to the Palestinian ambassador to speak at a later date. ‘Universities play an important role in society as places of debate and discussion where ideas can be tested without fear of control, where students learn to challenge ideas and think for themselves, and where rationality underpins the pursuit of knowledge,” she said. “Queen’s permits freedom of thought and expression, within a framework of respect for the rights of other persons, and academic freedom is enshrined as a guiding principle in the University’s Charter and Statutes.